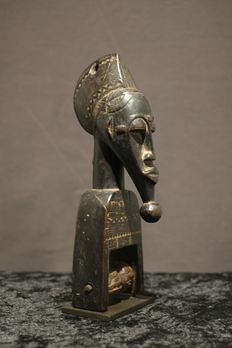 No Limit Exclusive African Art Auction. Since my auction ( that is ending in a few hours) is doing so well I'm mailing you a valuable gift inside each package as part of what might be the most ridiculously generous surprise ever. Maybe you'll get a book, or a complementary object, only the winners will know. From the 1940's – Good condition. Rare and Seldom Holo Nzambi frame from the nzo santu house- D.R.C. Congo. Sold with a custom made stand. NO PRICE LIMIT. FREE DELIVERY. Height: 32 cm and thin 0.5cm to 2 cm, and large 15 cm. Condition: Dry patina, Brown patina. Custom made stand included. Origin: The HOLO NZAMBI frame comes from the Holo tribe, Congo near Angola and around the Lake Tanganika. Provenance: Gaetan Schoonbroodt, Verviers, Belgium. Typical for the Holo those figures in frame reminds of the Christ figure, and serve as lucky charm decoration in the house and the owner consult it for advice. (Neyt, 1982). End XIXth-Early XXth – Good condition. Provenance: Collection of Maria Wyss. Basel, Switzerland. FANG OKAK – Equatorial Guinea – border Gabon. Collection of Maria Wyss. Basel, Switzerland. Protective Fang peoples Okak group mask. XIXth century Equatorial Guinea (at the border with Gabon), Africa. Fine patina with clear signs of use, and with remains of a magical charge around the neck. This is a protective mask that was used during the hunting season. There are similar objects in e.g. the National Museum of Anthropology, Madrid. PROVENANCE: Collection of Maria Wyss. Basel, Switzerland. She was active in the 1960/1970 in Basel, Switzerland and well known in the world of collectors and museums for her good taste and knowledge and helped to the awareness of objects of great beauty and harmony. Double faced reliquary gardian named Mbulu-Viti by the Kota Obamba . Probable age mid-XXth or earlier. HEMBA ancestor half figure – D.R. Congo. Early 20th century – Reasonable Condition. Provenance Jan Kusters. This is a beautiful genuine and delicate statue of a Hemba Ancestor. Provenance: Collected in situ at the end of the 60's by a Dutchman. After that in Jan Kusters collection. The hole on top is filled with an offering to the statue honouring the ancestor. The Hemba people live in the southeast of the Democratic Republic of the Congo and are farmers and hunters. They live in vast plains surrounded by mountains. Only since the mid-1970s, François Neyt identified the Hemba statuary as a different style than that of the Luba. In the seventeenth century, Hemba societies were developing east of the Luba. Hemba ancestor figures are regarded as one of the finest expressions of African art. Because of their idealized realism and well balanced proportions Niembo style objects are sought after. Double BACONGO Representing two slaves. seated – offered figure- D.R.C. Congo. 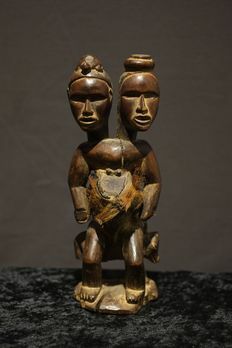 Rare double Bacongo figure layered grey patina from offerings. Carlo Monzino collection. Height: 19 cm, large 15 cm. Condition: Dry patina, grey color. Provenance: -Carlo Monzino (1931-1996), Castagnola, Switserland. 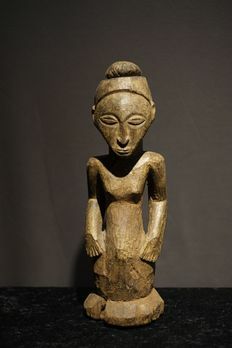 Bacongo figures are not easy to find, such a double female representation I have only seen on Ivory staffs. The Congo have lived along the Atlantic coast of Central Africa, in a region that by the 15th century was a centralized and well organized Kongo kingdom. They were among the first to protest slavery in letters to the King of Portugal in the 1510s and 1520s, then succumbed to the demands for slaves from the Portuguese through the 16th century. The Kongo people, state the colonial era accounts, included a reverence for their ancestors and spirits. 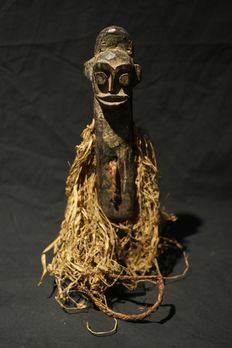 Only Nzambi a Mpungu, the name for the high god, is usually held to have existed outside the world and to have created it. A fine IDIMU MASK mythic small miniature -LEGA – D.R.C. Congo. First half XXth – Perfet condition. Height= 14 cm Sold with a custom stand. A mask which is not worn but manipulated and used as a mnemonic device linked with proverbs recited during the initiation rites . Several of those masks where on a stick . This mask symbolizes a Hippo animal. The Lega people live nearby the northern end of Lake Tanganyika on the banks of the Lualaba River in the Democratic Republic of the Congo also named the Warega. The social and political life of the Lega is regulated by the Bwami society, to which both men and women belong. There are seven levels for men, four levels for women. 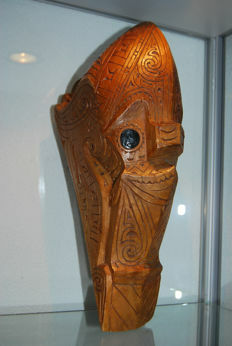 Most masks where used for initiation to one of the first two levels of the Bwami society. The white sections were repainted with Pembe each time they were used. Mid XXth – Fine condition. Provenance: Modou Sow, who worked for the Berg-en-Dal Africa Museum. 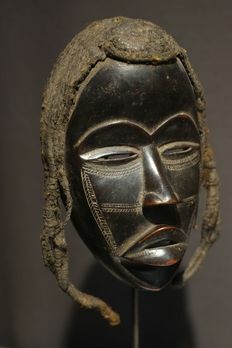 The Dan people live in the forests in the western part of Ivory Coast and eastern Liberia and made various masks characterized by a concave face, a pointed chin, a protruding mouth, an upturned nose and a high-domed forehead. Those mask where used to initiate young man to adulthood. Today they are used principally in performance for tourists, the various masks had traditional functions ranging from entertainment to initiation to social control. Early to mid-20th century – Good Condition. Provenance Gaëtan Schoonbroodt. 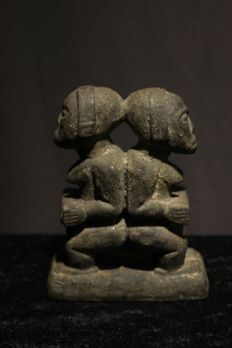 This is an interesting charged Bakongo male seated Nkisi Mirror Fetish Figure with 2 Heads seated on a dog – D R Congo. Provenance: collector Gaetan Schoonbroodt from Verviers, he travels on markets in the Benelux and France to find interesting objects. Central African power figures are among the most ubiquitous. 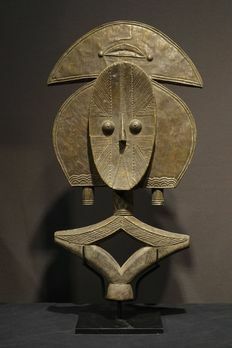 Housing mystical forces, they were collaborative creations of Kongo sculptors and ritual specialists.This example belongs to the most mysterious of that tradition, masters active in the early to mid-20th century and identified with Mangaaka, the preeminent force of jurisprudence. Dogs tied to the spiritual world in Kongo-mythology. Early 20th century – Reasonable Condition. Provenance French Collection. 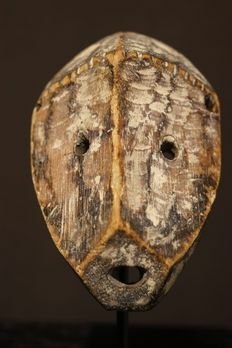 This is a genuine and seldom small Ekuk bush spirit mask from the Kwele peoples of Gabon. 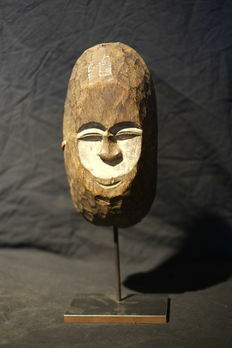 Most Gabon masks on the market are made for decoration, it is quite rare to find a genuine one. Layered patina, white kaolin, a little fiber in a hole on the side, one lower part of the mask is missing on the back. Provenance: a private Belgian collector, bought it at a small auction house, it was coming from a French Collection. The stylized oval mask with traditional heart shaped face and remains of offerings. Note the quality of the nose finely carved ! 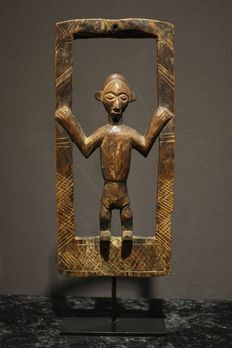 Figural BAULE HEDDLE PULLEY– BAULE-Ivory Coast. Early to mid-20th century – Good Condition. H= 23 cm on a custom made stand. This fine figural Baule heddle pulley was in use on a narrow strip loom, this pulley was both functional and aesthetic. It eased the movements of the heddles in separating the warp (see image) threads to allow the shuttle carrying the weft thread to pass through. The pulley also called attention to the skills of the sculptor who carved it, advertising his availability to undertake commissions to carve other figurative art, such as masks or shrine figures. Provenance Mr. Alphadjo Zagamor got it in a private collection in Paris. He told me these beards are inspired by the kings of ancient Egypt. All the objects can be viewed or picked up, if desired, at David Norden's African Antiques Shop in Antwerp. Click Here to See ALL lots. P.S. This is what happens if you don't sleep, the air conditioner in your fancy-pants studio breaks, and you forget to have breakfast before and you are happy so many peoples are bidding lol. Just because having happy clients is fun. P.P.P.S. Look also at my friends offering, a nice Batak Singa. If you like Batak Art click here ( no price limit). Collected between 1913-1932 by H. Westerop in Indonesia. H. Westerop lived on Java (Soerabaja, Fort de Kock, Blitar, Bandoeng en Batavia) and Sumatra (Medan). Description: This piece was part of a jewelry box according to relative who inherited this piece directly from H. Westerop.